Sr. Scientist – Henkel Consumer Goods Inc. The Class 25 Blog: This is a blog series about the experience and impact of Scottsdale Leadership’s seventeen core program days. The program informs, inspires and empowers leaders to champion and strengthen the interests of the community. Like many Arizonans, I am not a native of Arizona. I was born and raised in Houston, Texas, went to college in California, and reluctantly followed my husband here when he found a job in Phoenix. Adjusting to the culture shock of the Southwest was hard at first. I felt like I had left my heart in San Francisco. But over the years, we’ve become more comfortable here in the Valley as we have built our careers, friendships, and family. Then I experienced History and Bus Tour Day in the Scottsdale Leadership Program and had a revelation. I’m falling in love with Scottsdale! We started at the breathtaking Skyline Rooftop at the Hotel Valley Ho. We took an expert tour of downtown and learned about the Little Red Schoolhouse, where so much of Scottsdale’s history is housed. Then we headed north to Taliesen West and were graced by the presence of prominent architect Vern Swaback, who was a former apprentice and Director of Planning for Frank Lloyd Wright. We toured the immaculate grounds of the Four Seasons Resort, and ate lunch at the iconic Greasewood Flats. We saw handsome Arabian horses housed in a citadel at Los Cedros. Who knew? We experienced raw desert beauty at the McDowell Mountain Preserve. And finally we toured Scottsdale Stadium and the new Salt River Fields, all in the course of ONE day. Along the bus route and as part of our “homework”, the class members shared tidbits about Scottsdale’s history taken from Joan Fudala’s book Historic Scottsdale: A Life from the Land. It was intriguing to learn that many of my classmates have lived in Scottsdale their whole lives. All could remember Scottsdale’s humble beginnings and incredible growth over the past few decades. One even water skied behind a pickup truck along the canals. I even had my own piece of history to share. I recalled Dial’s Center for Innovation (DCI), where I worked before Henkel relocated two miles up the road. DCI’s building existed for 32 years, was demolished, and replaced with what is now the Scottsdale Quarter. Scottsdale is sophisticated, but wild at heart. It can give you refined art and architecture, but also sports, entertainment, and unparalleled beauty. There are numerous exciting and incomparable experiences in Scottsdale making my love affair with our city stronger everyday. Why do you love Scottsdale? For me, the best part of going through the Scottsdale Leadership program is the exposure to so many different perspectives and realities. Each class day allows me to remove myself from my everyday life to see how others experience their jobs and the community we share. As I progress, it becomes more apparent how diverse and complex the issues that Scottsdale faces. However, it also reinforces how uniquely beautiful and intriguing Scottsdale remains. On this Scottsdale Leadership program day we focused on building a healthy community. The healthcare industry is particularly interesting because it is unlike any other. It directly affects every person, truly regardless of age, gender, ethnicity, background, and any other differences. I came away from this day with a reinforced awareness to stay engaged, a sense of pride for the level of quality healthcare our community enjoys, and a greater appreciation for healthcare professionals. Healthcare finance and reform are daunting topics to explain. However, I appreciated both Brian Steines and Michelle Pabis from Scottsdale Healthcare in how they presented the topics. Both were articulate and knowledgeable and clearly communicated many of the issues and complexities. It is evident that the landscape of healthcare finance is changing and individuals have a responsibility to stay engaged in those developments. I was also surprised and reassured to see the quality of healthcare in Scottsdale. Clearly the primary objective is patient and employee satisfaction. Scottsdale Healthcare and Mayo Clinic serve as role models for other communities, and focus on individual holistic care. I appreciate the sense of community and collaboration in improving the health of Scottsdale as a common goal. Finally, this day made me think back to all the times when a nurse or doctor has touched my life. Nurses, doctors, hospital administrators, and other healthcare professionals are extraordinary individuals whose careers are based on taking care of others. These are special people that thrive on the human experience, and specialize in maintaining dignity in the most vulnerable of times. Every person in the room could testify to an experience where a doctor or nurse made a difference in their life. My mother has been a NICU nurse for over 35 years. She is a remarkable woman who not only worked night shifts just so she could pick me up from school each day, but I think of all the miracles she helped facilitate as parents were able to bring their babies home. I am extremely grateful and humbled by this astonishing group of people. When has a healthcare professional touched your life? There is one word to describe Arts Day in Scottsdale Leadership: PHE.NOM.EN.AL. I was completely astounded at the breadth of variety, quality, and quantity of art to be found in Scottsdale. The aspects of the Scottsdale art community I could appreciate most are the public art, the artistic heritage, and the art advocates. 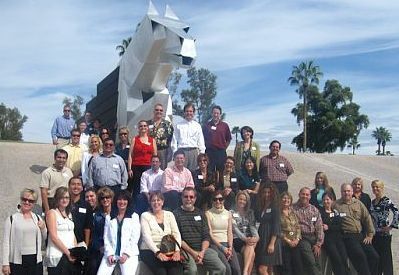 This Scottsdale Leadership Program Day included a bus tour of some of the public art that Scottsdale offers. I loved this part of the day because it forced me to take the time to appreciate my surroundings. As I gazed at the art elements which adorn the 101, I realized that I had never been a passenger along this road. My solitary commute to work never allowed me to see the beauty that was there all along. Public art in Scottsdale is a treasure and can serve as a point of pride for each member of the community. It speaks to the importance of art as an essential component of our everyday life and the fight to maintain that priority. It allows for equal accessibility because everyone can appreciate pubic art. Whether or not you like or dislike a piece, the art provokes thought, keeps the discussion going, and beautifies our surroundings. It is these hidden gems in the community that really sets Scottsdale apart. Art is Scottsdale’s heritage. Artists from around the world from different points in history have called Scottsdale home. The art here serves to preserve our past and celebrate the present and future. During the art walk, our class had the privilege to visit Expressions In Bronze and meet Dave McGary himself. His internationally renowned sculptures were absolutely breathtaking. He spoke of his 7th grade art teacher, also the school football coach, who inspired him to become an artist. As a teenager, he became an apprentice in bronze-making in Italy, and the rest is history. Later in the day, we learned how art can benefits our youth by encouraging better test scores, self esteem, and even time management. We appreciate art because it is part of Scottsdale’s past, but it is clear that it must also be part of the future. Finally, the most phenomenal aspect of this program day was all the people involved. Never have I met a group of people with such passion for their work. The artists, curators, performers, volunteers, and advocates, they all clearly love what they do. That passion is contagious. These people live, eat, and breathe art. They create for a living. That is inspiring, inspiration to go to a museum, stop to gaze at sculpture on the side of the road, or attend a live performance. I am still amazed at how much resides in our own community. Please share with me, what is your favorite art destination in Scottsdale? Education is one of the most vast and complex issues that face our community, and the fact remains that there are no clear cut resolutions. 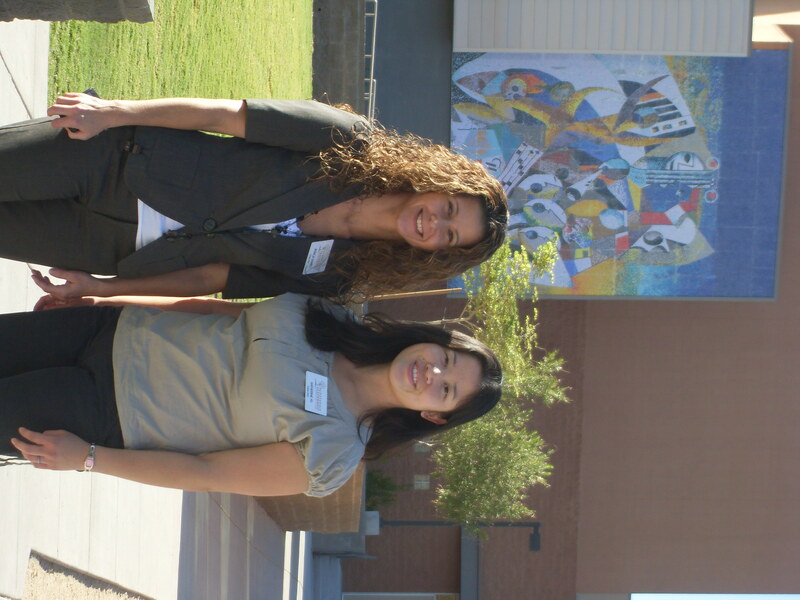 On this Scottsdale Leadership program day we were able to listen to many perspectives regarding education. There were few aspects where I could see where groups were aligned and fewer where solutions were agreed upon. However, there are some things that are indisputable to all groups. Education is important; it provides a foundation for individuals and our community; it is changing at a rapid pace, faster than even we can comprehend; and finally, reform is necessary. What shape or form this change will take is unknown, but change is imminent. Education in Arizona affects everyone. As cliché as it sounds, the children are our future. The next generations will be our future workforce, community stewards, policy makers, and leaders. We need to be sure that our young people are prepared and have the skills necessary for the real world. How can we be sure that we are doing our best to guide them, mentor them, and provide for them? How do we know they are ready? What do they need to know? One undeniable area which our young people must be proficient in is technology. Technology has infiltrated our everyday lives. Electronic devices are no longer luxuries, but necessities to be prepared for the 21st century. Kids are learning differently with access to information, globalization, exposure to languages, cultures, and (every parent’s nightmare) social networking. As parents, teachers, and mentors, we need to make sure our young people have access and are proficient in using technology. Lastly, it is clear that reform is necessary. The “finance puzzle”, as Dr. David Peterson so skillfully articulated, needs to be solved. An outdated, decades-old funding formula cannot be used today. Making schools choose between teachers and arts programs, or between staff and all-day Kindergarten, is plainly not acceptable. Incentives and motivation to excel are vital. Accountability is key from our students, teachers, administrators, parents, and communities. Obviously we care for our children and we understand the importance of education. Scottsdale Unified School District superintendent Dr. Gary Catalani was certainly inspiring with his vision for the Education community. Certainly change starts with strong leadership, and certainly change will not occur overnight. My certainties end here. 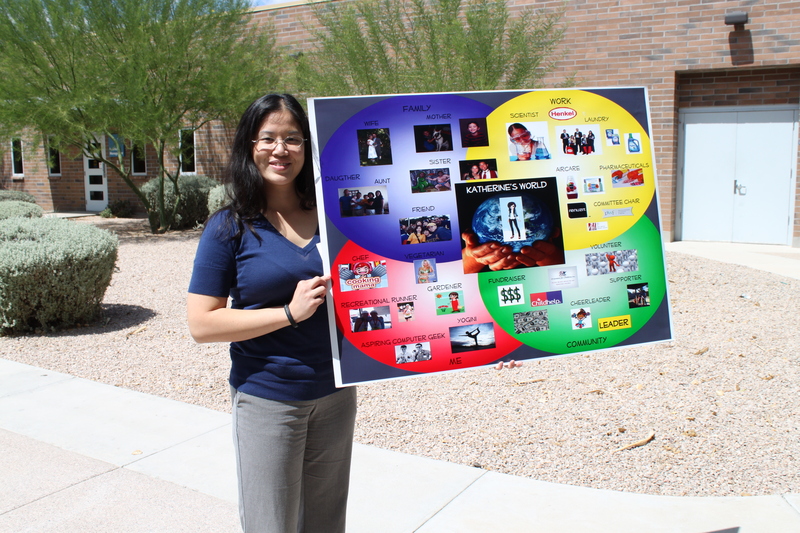 What do you think will ignite change for the betterment of Arizona’s educational system? Did you know that Arizona has the second worst poverty level in the country next to Mississippi? Yes, you read that correctly. We have one of the highest levels of people living in poverty the country. When you hear the words: needy, poverty, hunger, neglect, isolation, it is easiest to imagine an impoverished developing country where people are struggling to survive. It is difficult to know that these words describe your own community. For me, Social Services and Youth Issues Day redefined these words. We all play a part. We are all connected. Today there is dire need in our community, but ironically the resources are diminishing. When faced with so much tragedy and struggle, we can find hope, resilience, and human connection. The Vista del Camino Community Center in south Scottsdale provides social services to those in need. Donate food items, clothing, money, and time. Scottsdale has three amazing senior centers. Stop by, be a holiday angel, offer your skills, teach a class, be a friend. Protect our youth by instilling self-worth, confidence, responsibility and accountability. It takes ONE caring adult to make the difference in a young person’s life. Be a mentor, big brother, or big sister. Be present. Even if you do not have children, those of us that do need your help. It takes a village. The needs are growing, resources are diminishing — What will you do today? 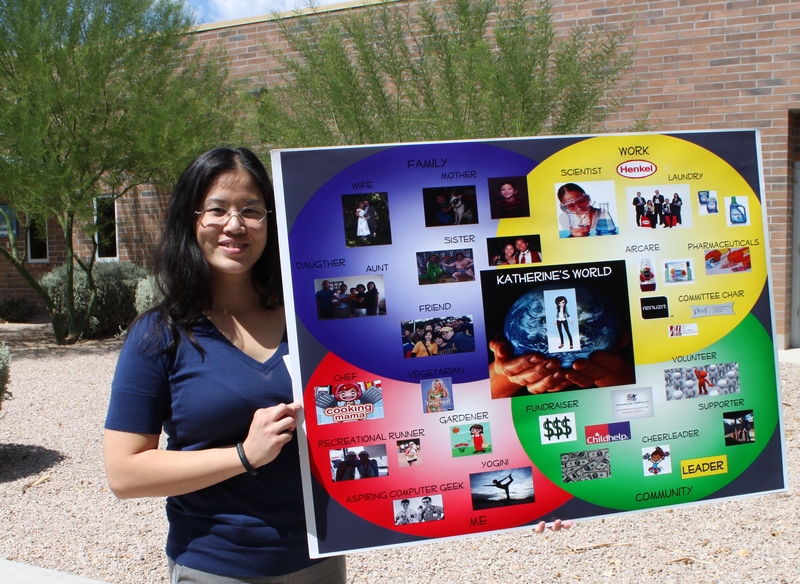 This is a blog series about the experience and impact of Scottsdale Leadership’s seventeen core program days. The program informs, inspires and empowers leaders to champion and strengthen the interests of the community. If I had to describe orientation in one word, it would be “inspired.” I choose inspired because every aspect of Day One was a source of inspiration. The speakers and volunteers spoke with such pride and fondness of Scottsdale Leadership. The program was so meticulously and thoughtfully assembled by the Staff. There was no detail left unnoticed or untended to. Even the careful construction of the roster for Class XXV was apparent. The heritage and pride for the program, along with the longevity of 25 years of legacy is obvious. This silver anniversary is both triumphant and hopeful for everyone involved. Rarely will you find a meeting of four dozen people with the eagerness and drive of our Class XXV. I was struck by the diversity of background, skill, and experience of the group. I was even more surprised to see the diverse group come together with such ease and cohesiveness. The common themes of family, community, and making a difference for the future were embodied in every 90 seconds. Our common goal to learn and make positive change was bonding. John Little was particularly inspiring. The lack of leadership on a global scale is disappointing. “Where are all the leaders?” he asks. What does it mean to Lead Out? What does it mean for our Class? What does it mean for me? What is the fire in your belly that gives you the passion and motivation needed to risk it all to lead out? What does it take to be a leader? Questions we hope will be answered over the next 9 months. To begin, we build on Arizona’s Five C’s. To lead you need: Curiosity, Creativity, Communication, Character, Courage, Conviction, Credibility, Charisma, Competence, Common sense, and Concentration. To seek out strengths in others that you lack. To listen for the question that wasn’t asked. If the first day of class is any indication of what is in store for us over the next 9 months, we need to hang on for the ride of our lives. I could feel the anticipation and eagerness as we left the room. We were inspired by our teachers and guides, our community, our classmates, and ourselves. Day One was truly inspired. I would like to hear back from each of you on what might inspire you to lead out? Or how did Scottsdale Leadership inspire you? Scottsdale Leadership will host the 10th annual Community Leadership Awards Luncheon on Friday, Dec. 4, sponsored by APS and Scottsdale Insurance, at the Hilton Scottsdale Resort & Villas, located at 6333 North Scottsdale Rd. The event is open to the public and tickets are available at www.scottsdaleleadership.org.